Easy and delicious, these buttery cookies were all I could manage with a visitor arriving in a few hours. When there is so much to do and not enough time remaining, it is helpful to have some deliciously distracting treats–just in case I don’t get my house as clean as I would like. Created from simple pantry ingredients that I had on hand, the taste was rich and sweet, which meant I had to protect them from being devoured by family members (and myself) after we sampled a few a dozen. Pour all ingredients into a large mixing bowl. Using a fork or sturdy wooden spoon, blend ingredients together to form a thick dough. Shape dough into small balls (about 3/4-inch or 2 cm in diameter) and place on ungreased baking sheets 1 inch (2.5 cm) apart. 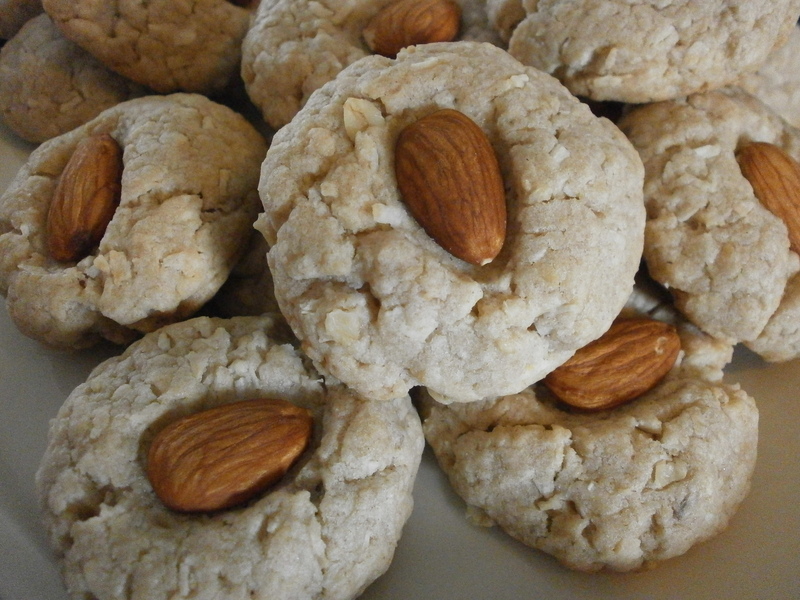 Press a whole almond onto each ball of dough to flatten it. 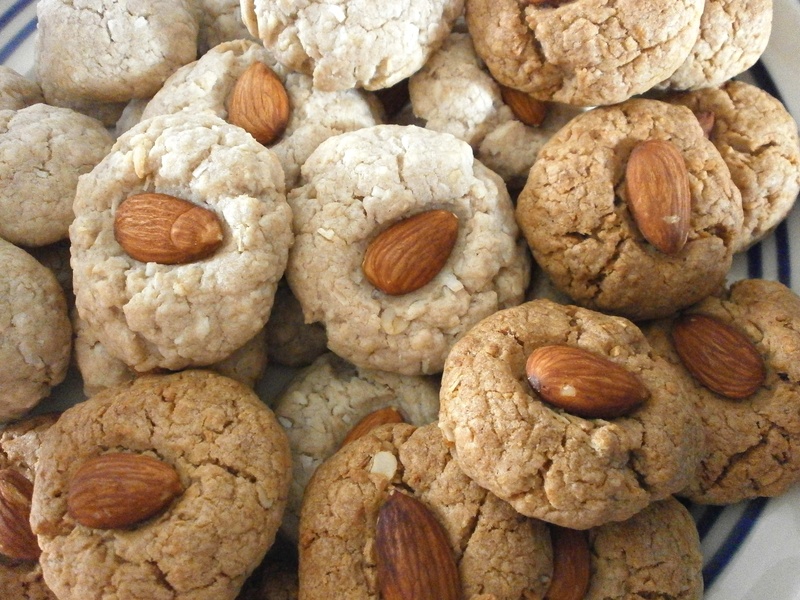 Bake at 350 degrees (180 C) for 12 to 14 minutes, until bottom edges of cookies begin to brown. Cool cookies on baking tray for 2 minutes before transferring to a platter or wire rack to cool more thoroughly. One batch of cookies was baked longer than the others, which gave them a toasty flavour and darker colour. This recipe is linked to Tuesday Talent Show and more. I’ve seen a recipe like this before using Hershey kisses – this looks much healthier! I’ll have to try it out! Thanks for joining me at Saturday Dishes, Pinned~! Love simple and quick cookies! These look great! Thanks, Lucy! They work great for events too. I’m always hoping to make treats ahead of time, but end up falling back on easy favourites, like these cookies!